You are invited to – ‘THE BEST OF BROADWAY’ – celebrating ‘THE GOLDEN AGE OF BROADWAY’ LIVE AT TIKITANO | Marbella Marbella – Adelante! 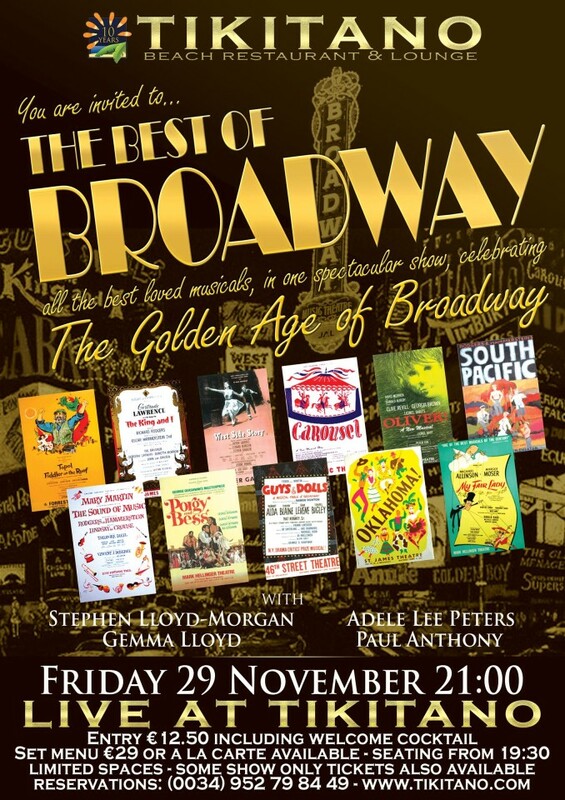 On Friday 29th November you are all invited to “The Best of Broadway” with a special show to celebrate “The Golden Age of Broadway” – with some of the best loved musicals of the era, including The King & I, West Side Story, Carousel, Oliver, South Pacific, The Sound of Music, Fiddler on the Roof, Porgy & Bess, Guys & Dolls, Oklahoma and My Fair Lady. A ONE NIGHT ONLY SPECIAL SHOW NOT TO BE MISSED! with the cast of one of our most popular shows “West End Musicals in Concert” who bring you this one night only special show. Entry tickets are 12.50€ and we serve a menu of just 29€ or the a la carte is also available. Bookings are essential, as this show will be a guaranteed sell out! Some show only tickets also available.